Once again I am joining Cathy for In A Vase On Monday, a weekly invitation to fill and share a vase using materials gathered from one’s garden. With a large pass-along gardenia starting to flower last week, what to use in my vase this week was an easy decision. Gardenias are quick to brown and I find them difficult to photograph, but these minor flaws are easily overlooked with one whiff of their sweet perfume. The entire experience of gathering, arranging and photographing these gardenias was accentuated by the remarkable fragrance of the flowers. 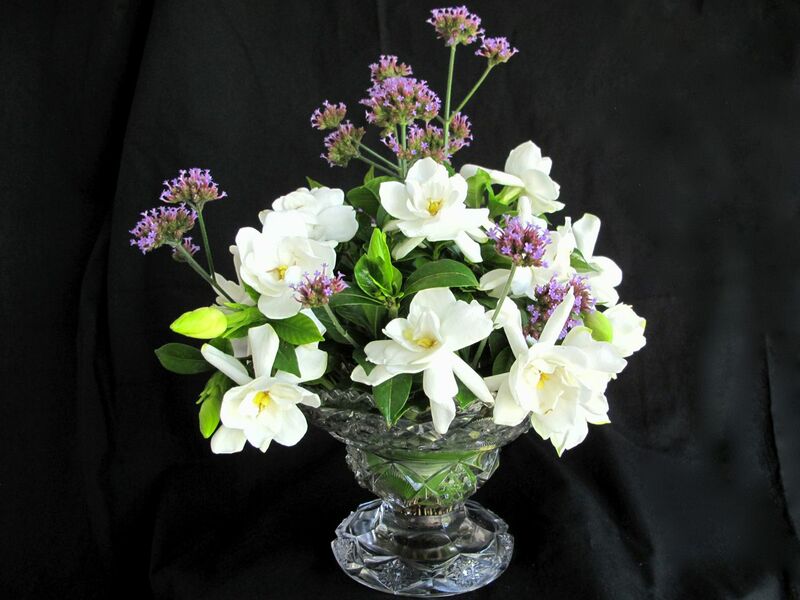 Three stems of Verbena bonariensis inserted into a small, one inch floral pin holder doubled as an armature around which the gardenias were added. Today’s container is a traditionally-shaped pressed glass dish that had belonged to my aunt. Rarely used, it is the perfect size for the number of flowers I collected. The arrangement adds an graceful detail to the dining room buffet. A big thank you to Cathy at Rambling In The Garden for welcoming everyone to join her in this addictive Monday diversion. Please visit her to see what she and others are placing In A Vase On Monday. This entry was posted in garden and tagged flower arranging, flower design, garden photography, gardenia jasminoides, in a vase on monday, nature photography, verbena bonariensis on June 1, 2015 by pbmgarden. So pretty! My gardenias have just gone over, but what a joy they were. I’m still pretending some of my other gardenia shrubs are going to make it, although they look like sticks. It surprised me how well this particular shrub is blooming. As you know I always admire your Gardenias. The arrangement is very attractive with the addition of the Verbena, which I find doesn’t last all that well in a vase but is worth it even for a couple of days. You’re right about the verbena, it doesn’t really last well. My vase from last week is still in decent shape but this one will be short-lived. Don’t think the gardenias will keep either, but for the scent it’s worth it. Lovely vase – and so nice to see the gardenias. I just know them from greenhouse growing. The pictures almost allow me to smell them! Thanks Cathy. Sitting on the front porch the scents wafts in the breeze. Beautiful! You are so lucky to have that many gardenia flowers. My bushes in Africa bloomed, but with only a few flowers at a time. Thanks Cindy. Some of my gardenias seem dead or dying after our cold winter, but this one bush has been prolific this week. Hope you’re adjusting to your new surroundings. 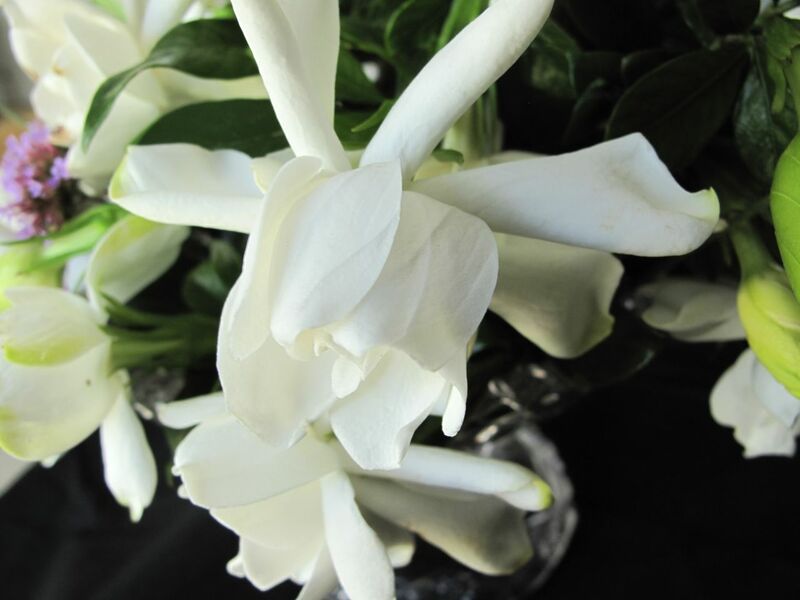 Is there a gardener out here in any zone who doesn’t just smile at a beautiful, fragrant gardenia? I don’t think so. Gorgeous. Judy you may be on to something. I’d like to think everyone is smiling today. Thank you Stepheny. If you were closer I would bring you some gardenias Stepheny. The scent has been delightful as it greets me as soon as I enter the house. 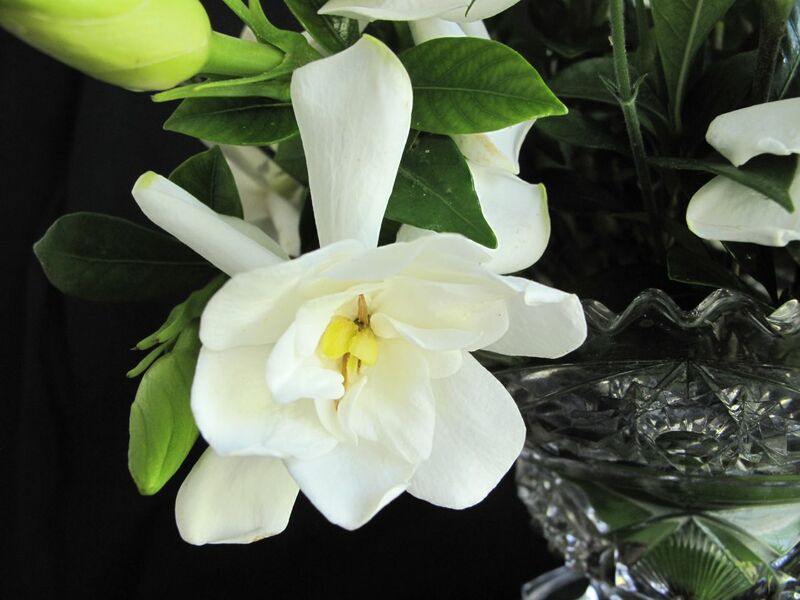 Fabulous elegant look with the vase and gardenias Susie….do you know I have never smelled them in person as they do not grow here. And I love the addition of verbena to the arrangement. Thanks Donna. I hope you’ll have an opportunity some day to experience their fragrance first-hand. Always nice to bring out seldom used pieces with memories attached. 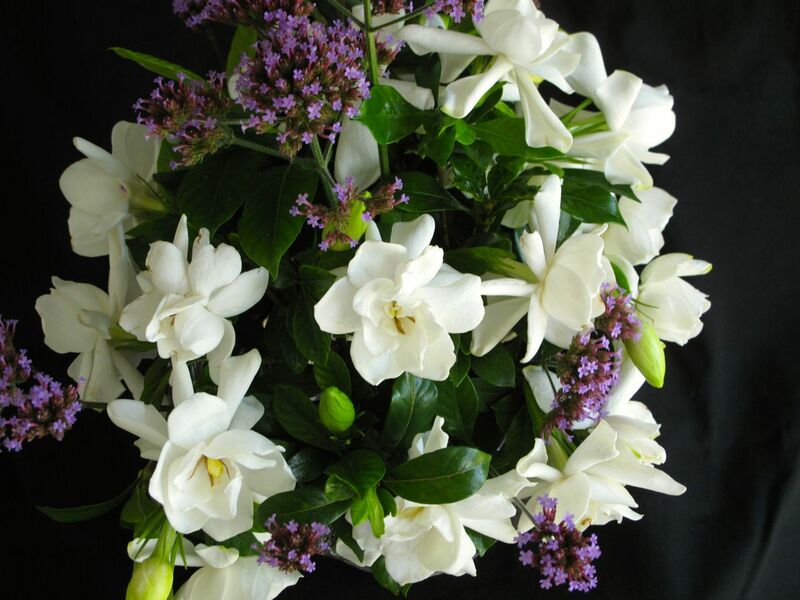 Speaking of memories, mine allow me to conjure the scent of gardenias by just looking at your lovely bouquet. So happy you can smell them Rickii. I’m SO impressed by your ability to work with those gardenias, Susie! I’ve found it nearly impossible to get even a half-way decent photograph of the flowers that appeared on my gardenia shrub following our unexpected May rains – and I didn’t even try arranging them in a vase. Thank you very much Kris. I must say it’s hard for me to photograph any white flower. Why is that? The gardenias weren’t terribly cooperative when I was arranging them, but I didn’t want to use oasis. They also aren’t lasting very well (already turning brown), but their fragrance is even nicer today. 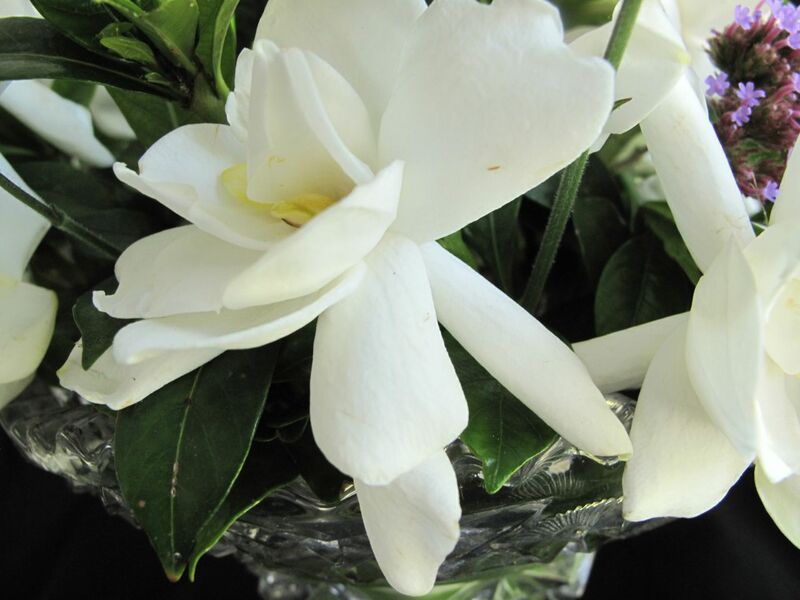 I am so jealous Susie – I would love to be able to grow a gardenia! The flowers are beautiful but it is the scent I really covert. 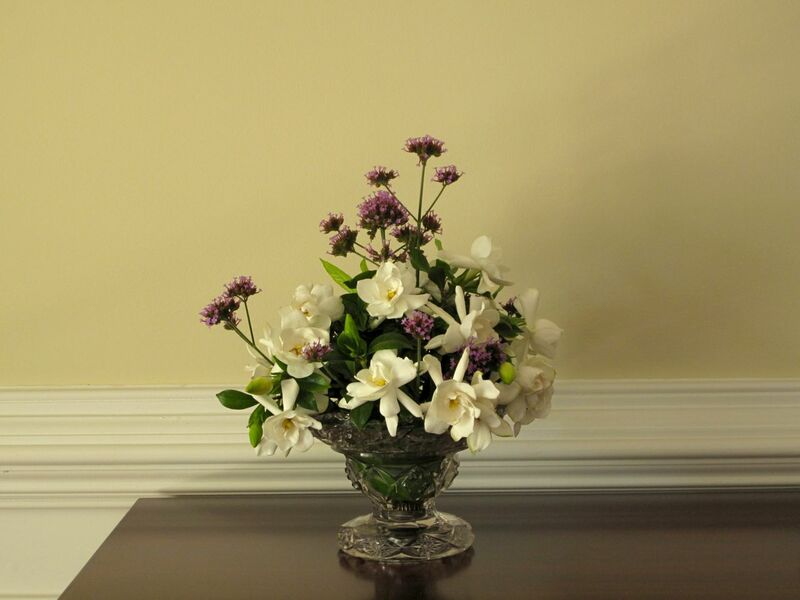 Your arrangement works so well with the support of the viburnum and that vase is stunning. Gardenias looks so nice, I must find out if I can grow them in my garden, too. A beautiful vase, Susie! Thank you Anca. I hope you’ll find you can grow gardenias. They are sometimes sold as houseplants but mine have never done well that way. A lovely elegant vase Susie. Your gardenias are so fragile looking, and I can only imagine how they smell as I don’t think I have ever seen any in “the flesh” so-to-speak! I think you’d like gardenias in person Cathy. The flowers are not long-lasting but they do have beautiful creamy petals when fresh. Thanks so much! I hope your gardenias do well. They don’t last indoors for me very long but are so worth cutting a few anyway. It smells sweet and it looks sweet! Thanks Jason. I’ve been watching the flurry of activity on FB as everyone prepares for the Fling. Have fun. Must be nice to have that beautiful fragrance in the house! The gardenias have filled the house with the nicest scent. Mine didn’t bloom last year either but one shrub at least seems better than ever this year. Lost the hydrangeas again from the late cold snap. NIce to see your gardenias have survived the harsh winter and blossom profusely. Your arrangement has never failed to amaze me. Actually most of them look terrible, but this particular one is the exception. Thanks for the nice words about the arrangements. I enjoy this chance to make a vase each Monday.